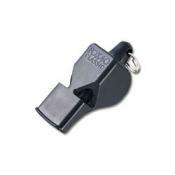 Fox 40 Whistle; for official use; extremely loud. For use in large, crowded gymnasium setting! Revolutionary design allows for 3 aerodynamic wind chambers to deliver a sharp, clear tone with less effort. No cork ball to stick or deteriorate. Unaffected by moisture. Caution: Extremely Loud. Recommended for official use only.